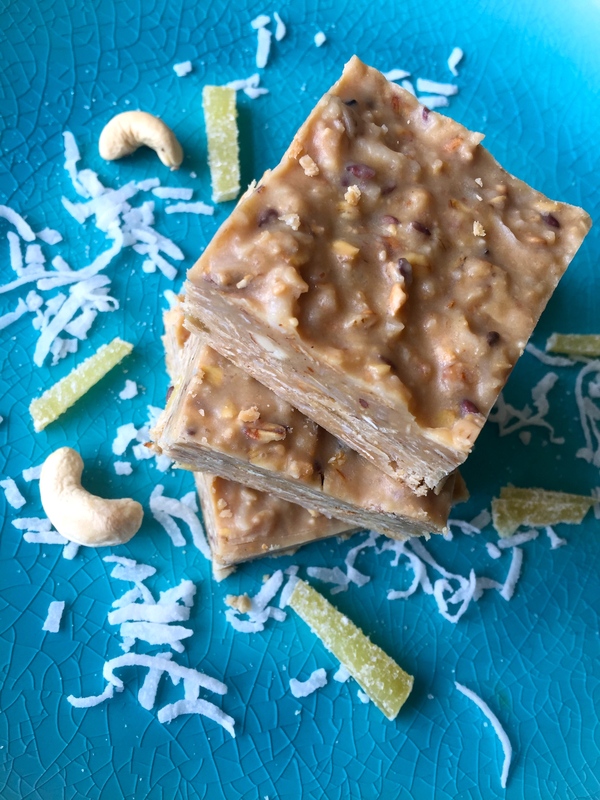 Let’s start with the easiest recipe, the Coconut Cashew Ginger Bars, then we’ll go to our “workshop” with the owners of CRAVE before ending with a bit of candy-making that will be a good recipe for cooks looking for a challenge. The first recipe doesn’t even need baking so give it a try. 1. Stir the cashew butter with the honey and coconut oil over low heat in a saucepan until melted and smooth. 2. Remove from heat; stir in the granola, cashews, ginger and coconut, and then add the vanilla and white chocolate chips. 3. Press into a 7x10X2 inch glass baking dish and refrigerate until set. 4. Remove from the refrigerator a few minutes before you’d like to cut into bars to serve. 5. Enjoy this tropical treat in small squares on a “dainty” platter or cut larger portions and eat as an exotic energy bar. 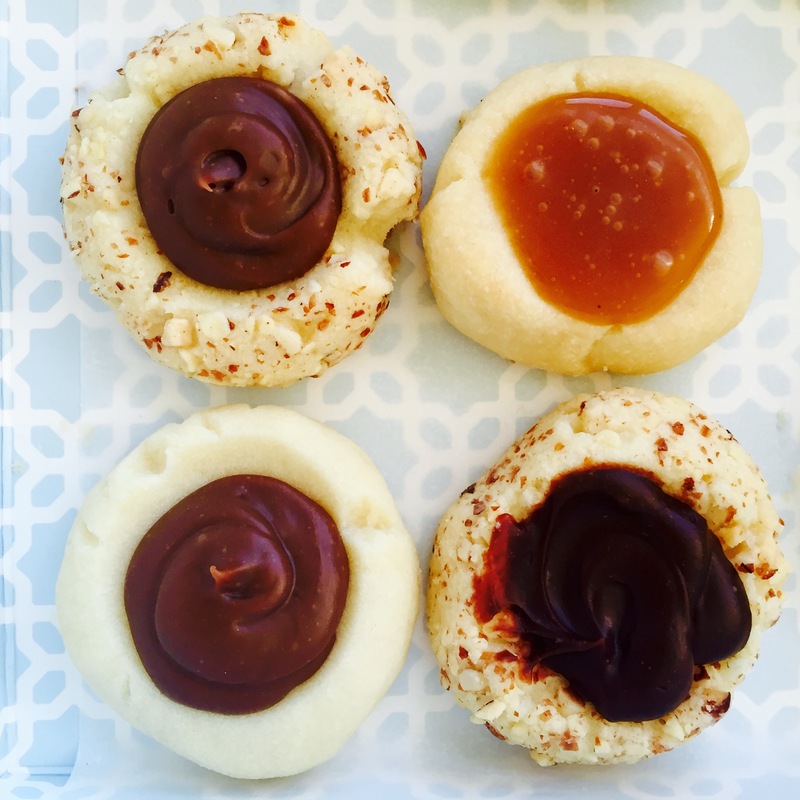 Now, let’s go onto a mini-workshop with the owners of CRAVE as they mentor you through the making of one of their most popular holiday treats, Thumbprint cookies. They will make 833 dozen this holiday season. That’s almost 10,000 cookies. They make 20,000 shortbreads. Now you know why they start early. Crave is a very authentic Alberta business. The founders and owners, two sisters named Carolyne McIntyre-Jackson and Jodi Willoughby, grew up with the joy of great baking in their lives and they wanted to share that with authentic taste with others. They’ve been in business 11 years now and own four stores in Calgary, one in Edmonton and one in Saskatoon and they are still the only owners. Carolyne and Jodi grew up on a ranch near High River, Alberta. There is a long tradition in this mostly rural province of “dropping by” for a visit with one’s ranching neighbours. “The Crave Sisters” learned to bake from their Mom Helen McIntyre. Helen always had a few tins of sweet treats at the ready for when friends popped in. She’d put on the coffee and they’d all sit and visit. This time of year, Helen switched to baking special treats in preparation for the holidays. Thumbprints are a little tricky to make so it’s great to have a few tips the first time you make them. Place the butter and sugar in a mixer and beat until light an fluffy and warm. Tip: the sisters shared that they always start with cold butter and beat it with the sugar for about 10 – 15 minutes. It will warm up, melt the butter and you’ll end up with a great mouth feel and consistency for the finished product. Add the 2 cups of flour slowly and combine until a smooth dough is formed. Scoop small tablespoon portions of dough and roll each into a ball. Note: if you’d like a nut coating for your cookie, roll the balls into finely chopped almonds, pecans or hazelnuts at the point. Place the cookie balls on a baking tray a few centimetres apart. Press down into the cookie to form a “thumbprint” with the round back of a ½ teaspoon from a measuring set. Bake for 20 – 22 minutes or until the bottoms are lightly golden brown. Fill with milk chocolate ganache (or carmel or apricot, strawberry or raspberry jam) filling and garnish with slivered almonds or hazelnuts. 1.Place milk chocolate chunks in a bowl and set aside. 2.Bring the whipping cream just to a boil. 3.Pour the hot cream over the milk chocolate chunks. Let sit for 5 minutes. 4.Stir with a spatula until well mixed and no lumps are visible. 5. Cover with plastic wrap and refrigerate until set. To use: warm up slowly and gently to a consistency that is easy to squeeze through a piping bag. Yield: 15 to 20 pieces depending on the size you prefer. Tips: You’ll need a wooden spoon, candy thermometer and a rolling pin (marble works best) for rolling out the sticky candy. Reserve a wooden spoon especially for candy making so that the unwanted flavours of other food are not inadvertently transferred to ruin your batch of candy. Jaggery is a block of unrefined cane sugar. If your jaggery is soft, then it will take a half a cup of water but if the jaggery is harder you may have to add about a quarter cup more. Soft jaggery has more moisture than the hard jaggery and for that reason, it facilitates the candy making process because you don’t have to cook it as long and there is less chance of it turning dark or burning. 1. 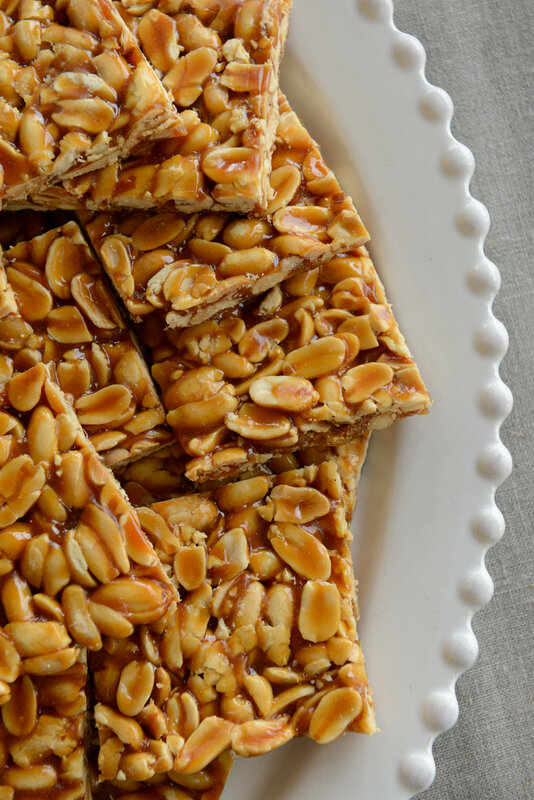 Spread the peanuts on a baking tray, use a heavy object to flatten them and separate them into halves and then roast them at 150°F until golden – about 2 hours. Let them cool and set them aside. 2. Boil the jaggery and water until the jaggery melts then strain the jaggery mixture through a fine sieve and return it to the saucepan. Tip: Noorbanu puts the jaggery and water in the microwave and cooks it on high for 1 minute intervals – stopping to stir and break up the jaggery between each cycle. It takes about 8 minutes this way and saves her needing to stir it constantly like the stove top method. 3. Continue to cook on medium heat until thick. 4. Test the jaggery to see if it at the “hard crack” stage of candy making (and ready for the peanuts to be added) by dripping a few drops of the jaggery mixture into a shallow plate of cold water (set this up ahead and keep it beside you). Pick up the jaggery that you dripped into the water between the thumb and forefingers of your 2 hands – if it cracks apart when you try to break it, then it is at the “hard crack stage” and it means it is done. This usually happens when a candy thermometer reads 300˚F. If it just stretches and bends like sticky toffee or caramel it is not there yet. Tip: Be careful to keep the heat on medium. It may take a little longer at this temperature but it will help prevent burning of the sugar. 5. Add the roasted peanuts and mix well once the jaggery hits the hard crack stage. 6. Quickly spread the mixture onto a waiting greased cookie sheet. 7. Roll thinly with a marble rolling pin then cut into desired shapes while still hot. 8.Store in an airtight container (this is especially important if you live in a humid environment as humidity makes the candy sticky). Unless you have an industrial mixer do not try to cream cold butter and sugar you will burn the meter out of your mixer. Crave uses a Kitchen Aid Pro mixer. I have one at home. Got it on sale several years ago and it has stood up very well to years of double batch biscotti making and beating. You are right. Most mixmasters are pretty wimpy. My old one, died one day in the middle of a batch of biscotti. The money I spent on my Kitchen Aid, was money well spent. I love to bake.